The Census of Quirinius was a census of Judea taken by Publius Sulpicius Quirinius, Roman governor of Syria, upon the imposition of direct Roman rule in 6 CE. The Gospel of Luke uses it as the narrative means to establish the birth of Jesus (Luke 2:1–5), but places it within the reign of Herod the Great, who died 9 years earlier. No satisfactory explanation of the contradiction seems possible on the basis of present knowledge, and most scholars think that the author of the gospel made a mistake. Mary and Joseph register for the census before Governor Quirinius. Byzantine mosaic c. 1315. 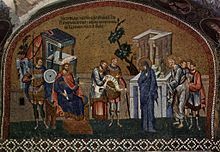 In 6 CE the Roman Empire deposed Herod Archelaus, who ruled the largest section of Judea as a Roman client king, and converted his territory into the Roman province of Judea. Publius Sulpicius Quirinius, the newly-appointed Imperial Legate (governor) of the province of Roman Syria, was assigned to carry out a tax census of the new province. According to Josephus, a Jewish historian writing in the late first century CE, Jews reacted negatively to this census. Most were convinced to comply with it by the high priest, but some joined a rebellion led by Judas of Galilee. There are major difficulties in accepting Luke's account: the gospel links the birth of Jesus to the reign of Herod the Great (Luke 1:5: "In the days of King Herod of Judea there was a priest named Zechariah..."), but the census took place in 6 CE, nine years after Herod's death in 4 BCE; there was no single census of the entire empire under Augustus; no Roman census required people to travel from their own homes to those of distant ancestors; and the census of Judea would not have affected Joseph and his family, living in Galilee. Some conservative scholars have argued that Quirinius may have had an earlier and historically unattested term as governor of Syria, or that he previously held other senior positions which may have led him to be involved in the affairs of Judea during Herod's reign, or that the passage should be interpreted in some other fashion. Such arguments have been rejected on various grounds, including that there is no time in the known career of Quirinius when he could have served as governor of Syria before 6 CE, that the Romans did not directly tax client kingdoms, and that the hostile reaction of the Jews in 6 CE suggests direct taxation by Rome was new at the time. Ralph Martin Novak says that these conservative interpretations spring from the assumption that the Bible is inerrant, and Géza Vermes called such arguments "exegetical acrobatics". Most scholars have concluded that the author of Luke's gospel made an error. ^ Gruen 1996, p. 157. ^ Edwards 2015, p. 68–69. ^ Sanders 1995, p. 111. ^ Gruen 1996, p. 156. ^ Edwards 2015, p. 71. ^ a b c Brown 1978, p. 17. ^ Gruen 1996, p. 156–157. ^ Brown 1977, p. 552. ^ Bruce 1974, pp. 193–194. ^ Habermas 1984, pp. 152–153. ^ Boyd & Eddy 2007, pp. 142–143. ^ Novak 2001, p. 293–298. ^ Brown 1977, pp. 552–553. ^ Novak 2001, pp. 296–297. ^ Vermes 2006, p. 28–30. Allert, Craig D. (2007). A High View of Scripture?. Baker Books. ISBN 9780801027789. Blomberg, C.E. (1995). "Quirinius". In Bromiley, Geoffrey W. (ed.). The International Standard Bible Encyclopedia. 4. Eerdmans. ISBN 9780802837844. Boyd, Gregory A.; Eddy, Paul Rhodes (2007). Lord or Legend?. Grand Rapids: Baker Books. Brown, R.E. (1977). The Birth of the Messiah: A Commentary on the Infancy Narratives in Matthew and Luke. Doubleday & Company. ISBN 9780385059077. Brown, R.E. (1978). An Adult Christ at Christmas: Essays on the Three Biblical Christmas Stories. Liturgical Press. ISBN 9780814609972. Bruce, F.F. (1974). Jesus and Christian Origins Outside the New Testament. Grand Rapids: Eerdmans. Edwards, James R. (2015). The Gospel of Luke. Eerdmans. ISBN 9780802837356. Freeman, Charles (2009). A New History of Early Christianity. Yale University Press. ISBN 9780300125818. Green, Joel (1997). The Gospel of Luke. Eerdmans. ISBN 9780802823151. Gruen, Erich S. (1996). "The Expansion of the Empire Under Augustus". In Bowman, Alan K.; Champlin, Edward; Lintott, Andrew (eds.). The Cambridge Ancient History. 10. Cambridge University Press. p. 157. ISBN 9780521264303. Habermas, Gary R. (1984). Ancient Evidence for the Life of Jesus. Nashville: Thomas Nelson, Inc.
Maisch, Ingrid; Vogle, Anton (1975). "Jesus Christ". In Rahner, Karl (ed.). Encyclopedia of Theology. A&C Black. ISBN 9780860120063. Merz, Annette (2015). "The Quest for the Historical Jesus". In Van Kooten, George H.; Barthel, Peter (eds.). The Star of Bethlehem and the Magi: Interdisciplinary Perspectives from Experts on the Ancient Near East, the Greco-Roman World, and Modern Astronomy. BRILL. ISBN 9789004308473. Millar, Fergus (1993). The Roman Near East, 31 B.C.-A.D. 337. Harvard University Press. ISBN 9780674778863. Novak, Ralph Martin (2001). Christianity and the Roman Empire: Background Texts. Continuum International. ISBN 9780567018403. Vermes, Géza (2010). Jesus: Nativity - Passion - Resurrection. Penguin UK. ISBN 9780141957449. Vermes, Géza (2 November 2006). The Nativity: History and Legend. Penguin Books Limited. ISBN 978-0-14-191261-5.